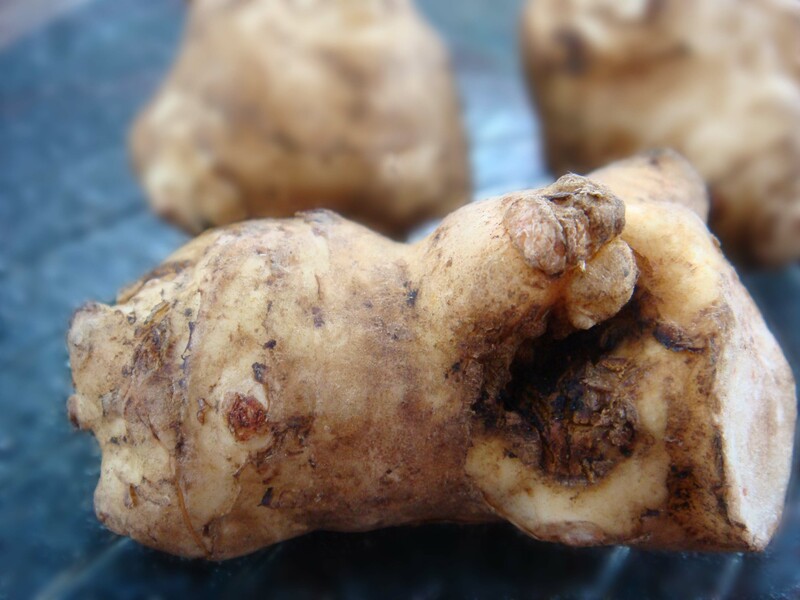 A sunchoke is an underground vegetable like a cross between a rutabaga, potato, sunflower seed, and water chestnut. Also called a Jerusalem artichoke, it is not like an artichoke bloom, nor does it grow in Jerusalem. It’s one of the few native tubers of North America. A sunchoke, related to the sunflower, makes a delicious addition to salad, salsa, marinade, and soup. Native Americans enjoyed digging up and eating sunchokes for centuries before the colonialists settled. Myths about the dangers of this starchy tuber kept Europeans for cultivating them until the threat was proved superstitious and they embraced the tasty vegetable. The sunchoke got its new name when a French explorer sent some plants back to his friend in Italy to cultivate in the Mediterranean climate. Thinking they tasted like artichokes, the Italian named the tuber “girasole articicco,” meaning, “sunflower artichoke.” Americans corrupted the pronunciation, which they thought sounded more like “Jerusalem,” but the name stuck. Staying on my 2009 plan to either try a new food or recipe each week, I bought a handful from Russo’s on Monday. 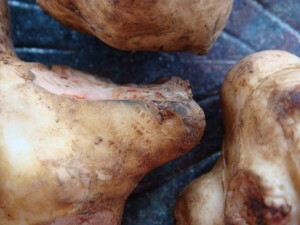 I have eaten sunchokes before, but have never cooked them. I took some pictures and liked them. Then I saw a photo on FoodGakwerthat pointed back to a lesson on how to blur the backgrounds on your food photos. I have been wanting to do this for a while, but since I have a ‘point and shoot’ digital, it’s easier said than done. So I installed an older version of Photoshop (v.7) on my laptop and went to town. Click here for the blog post that provides step-by-step instructions on how to accomplish this effect. Her directions are very thorough and easy to follow. I wanted to start with just a subtle blurring of the background to see how it looked and this was my first and only attempt (so far). Peel the sunchokes… which can be a bit tricky because they are so bumpy. I didn’t want to lose too much flesh, so I peeled them by hand with a paring knife. Cut them into 1/2 cubes and place them in boiling water for 10 minutes. 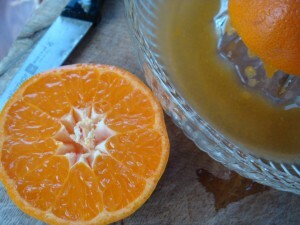 Transfer to a container (or blender) and add remaining ingredients. 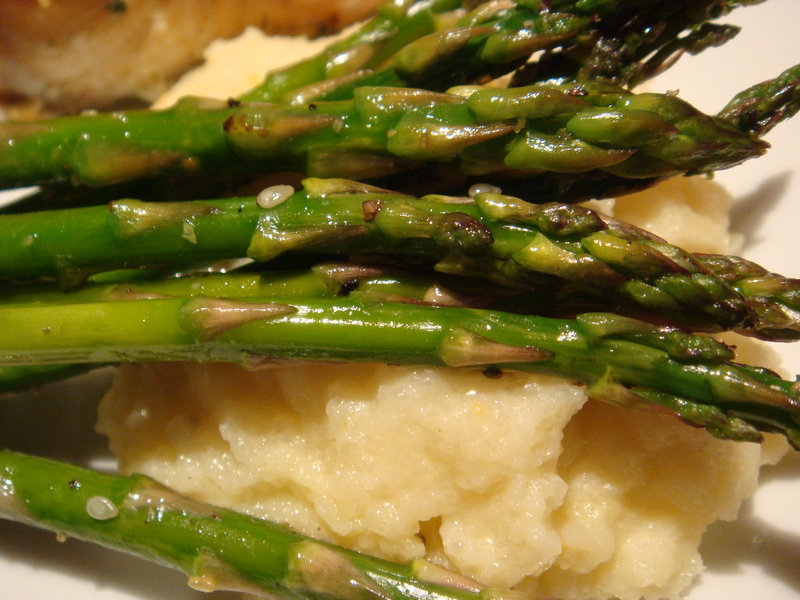 Use hand blender to puree. 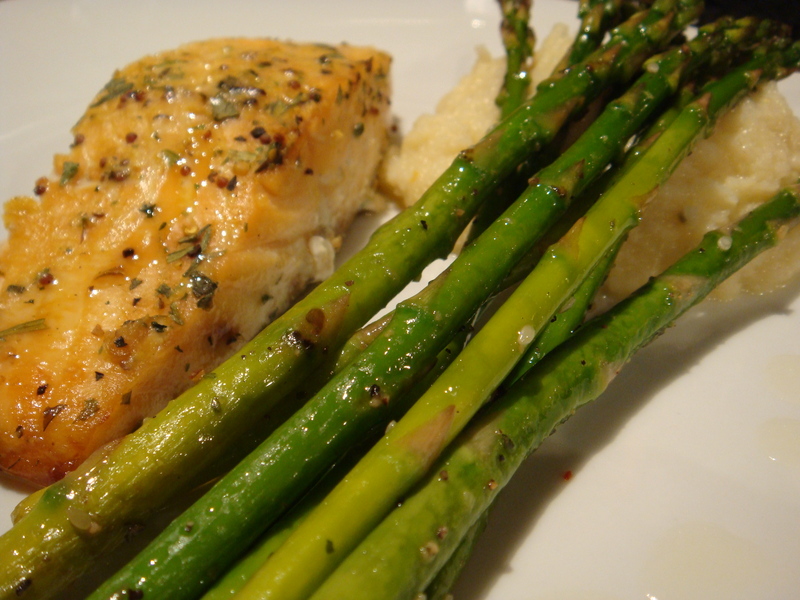 I served mine with oven roasted salmon and sauteed garlic asparagus. DELICIOUS! The clementines added a nice floral sweetness to the already somewhat sweet and nutty sunchoke, with the savory butter and the salt balancing out the flavor.